Break strain 1,361kg (3,000lbs). Built-in loop hook. Two Way Release. Quick automatic release. 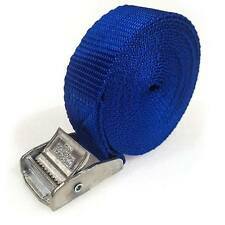 1"(25mm) wide nylon webbing for maximum strength. Double vinyl coated heat treated 'S' hooks provide a secure hold. Images shown for illustration purposes only. Box Stitching for Extra Strength. 4 CAM BUCKLE TIE DOWN LASHING. 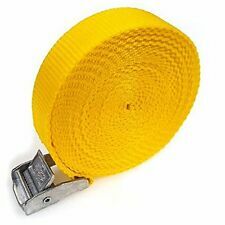 50mm-width Protective Webbing Pad under cam buckle protects your vehicle or any surface that might be scratched. Easy to fit; very secure. Holding cargo, luggage, windows, glass stillages, general tie-downs, roof racks, bike racks, cars, trailers, tarpaulins, storm ties, tent awnings, kayaks, canoes, windsurfers, surfboards. 10 x 10" BUNGEE CORDS. These mini bungee cords are ideal for light applications. Manufactured with a multi-strand rubber core and stretch from10" - 18" (250mm - 450mm ). 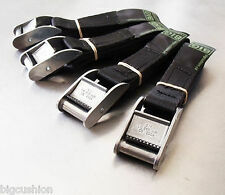 Each strap is25mm in width and2500mm in length. Tough, durable, and weatherproof polyester webbing with heavy duty steel ratchet. Machine Accessories. Length 5m. Kreg® Jigs. Product Images. Work Support. Woodworking Projects. Ventilation & Air Conditioning. Never misplace a ratchet strap again. Simple to install - Just screw onto your van panel. Each bracket are 40cm wide. Theblue powder coat creates a hard finish which is stronger, tougher and longer lasting than other paints. Breaking Strain - 250kg. Width 25mm. Heavy Duty 25mm Cam Lock Buckle. Material - Tough Polypropylene 25mm Webbing. Heavy Duty Cam Lock Buckle strap, Ideal for holding loads together. A 1 to 4 loading limit. This is a new Large Bungee cord 36"x60" for Car Van Truck & ATV/UTV Racks, Black Trailer Cargo Net with 12 Adjustable Hooks, and Made From highly Durable Elasticated Bungee Cord. 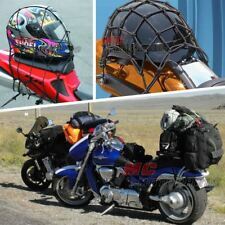 This bungee style cargo net has many uses.Net will fit over a variety of Trailers. 1x New Boot Side Cargo Storage Net. To fit suzuki Swift 2011-2017. Quick-release high-tension handle. S-hook ends. Resistant to cutting and abrasions. Conforms to BS EN12195. Rated 250kg Capacity 725kg. Lambda Sensors. Lambda probes & sensors. Delphi Oxygen Sensors. ENSEMBLE 3 PIECES POUR ARRIMAGE DE ROUE. Sangles en polyester ultrarésistant et cliquet à double blocage en acier usage intensif. Ensemble pour une roue comprenant Coutures renforcées au niveau du crochet en J et des cliquets pour une durée de vie prolongée. 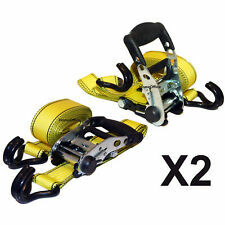 4 x Ratchet Strap Heavy Duty Tie Down - Size 7m x 50mm, Load 2000kg. Use: Securing / Lashing / Strapping / Fastening loads. Size: 7m Length by 50mm Width. The Trade Counter . Fasteners & Fixings. Hardware / Ironmongery. 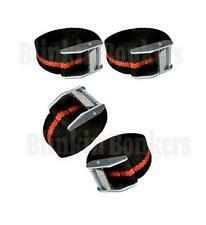 Quick-release high-tension cam buckles and protective, plastic-coated steel S-hooks. Machine Accessories. Hobby Tool. Tool Storage. Power Tool Accessories. Product Images. Work Support. Woodworking Projects. 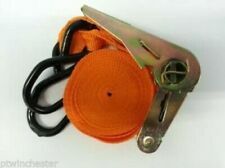 LASHING STRAP 4 T 8M 50MM. Lashing Strap. with stable ratchet handle,with precise labelling. high quality handle plastic casing. OF HIGH QUALITY TOOLS & CAR ACCESSORIES. All products are directly imported from Germany to our warehouses in the UK. WEIGHT CAPACITY = 1.5 TON. New Arrivals. This is a new Large Bungee cord 36"x60" for Car Van Truck & ATV/UTV Racks, Black Trailer Cargo Net With 12 Adjustable Hooks, Made From highly Durable Elasticated Bungee Cord. This bungee style cargo net has many uses. Durable weather-resistant polyester webbing with stitched reinforcement Automatic locking ratchet action secures items quickly and easily Quick-release high-tension handle S-hook ends Resistant to cutting and abrasions Suitable for tying down large, bulky and awkwardly-shaped loads during transit Conforms to BS EN12195. .
ARB’s Cambuckle Tie Downs will provide a quick and easy solution to securing your load to racks, trailers and cargo areas. > Zinc alloy cambuckle. Bury St Edmunds. Northern Way Industrial Estate. Large Trailer Cargo Net With 12 Hooks. Secure elastic net with 12 strong plastic hooks. 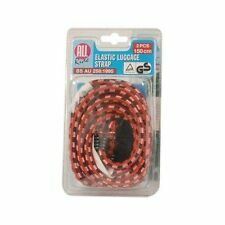 Ideal for securing contents of trailer, tow, camper, cargo, etc. Fitness & Exercise. Sport & Exercise. Breakdown & Jump Leads. 350kg lashing capacity with 725kg-rated breaking strain. Automatic-locking ratchet & quick-release tensioner. If there's a problem, just let us know and we will fix it. 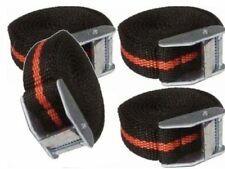 Weather, cut & abrasion-resistant polyester webbing with strong steel hooks. Do Not stretch beyond maximum useable length - 1130mm/44.5" (Approx.). The Skoda Roomster Parcel Shelf Cover is made of washable and waterproof material. The Skoda Roomster Parcel Shelf Cover is designed to fill the gap between the rear parcel shelf and rear seats, allowing the seats to be moved back and forth. Strong UV-stabilised polypropylene yarn net with elastic rope surround. During that process you will be issued with an RMA number. Vertical Cargo Net for NX. Quick release and tighten action. Vinyl coated 'S' hook for secure holding with reduced marking. Colour of strap may vary. Machine Accessories. Hobby Tool. Tool Storage. Power Tool Accessories. Kreg® Jigs. Product Images. Work Support. Woodworking Projects. This Car Luggage Securer is the perfect accessory for holding and securing large chunk of luggage to be transported by vehicles. With suction pads, each anchor will hold luggage as heavy as 20kg approx. Fro systems CAM tie down. Hook ends fit normal bars and oversized "Pro taper" style. Massive breaking strain. With aluminium karabiners. 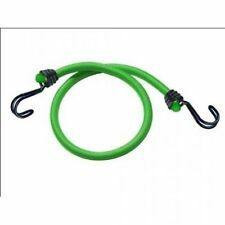 Motorcycle elastic bungee cord snap hook. Ideal for motorcycle touring, festivals & travelling. Width 25mm. Heavy Duty 25mm Cam Lock Buckle. For securing loads to vehicles plus many more uses. Material - Tough Polypropylene 25mm Webbing. Heavy Duty Cam Lock Buckle strap, Ideal for holding loads together. 8mm thick. Heavy Duty electrocated steel hook. Bookmark Us. 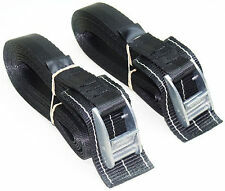 3.2M x 25mm Endless Strap (Pair). Size mm (external): 3200 (L) x 25 (W). These delux 5m tie downs have a protective neoprene flap to to stop scratches to your car/van. - High strength webbing. 12 Pc Piece Ratchet Tie Down and Bungee Cord Set. 8Pc Bungee cord: 2Pc-8mm x 40mm, 2Pc-8mm x 60mm. 12 Piece ratchet and tie down set is ideal for many applications from securing a cover for your caravan or trailer to securing a load in the back of your van. The plastic-coated S HOOKS are rated at 800kg. QUICK DISPATCH. Box Stitching for Extra Strength. 1.8m long strap. 2-piece Set. KEY FEATURES. 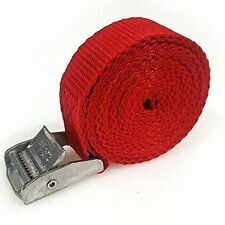 25mm wide webbing.